1Combine wood chips in large bowl and cover with water. Allow wood chips to soak while prepping the ribs and setting up the grill (at least 30 minutes). 1Have the butcher remove the thin, papery membrane on the bone side of each rack of ribs. To do this yourself, turn rib rack bone side up on cutting board. Use a flexible knife or fork to carefully lift up the edge of the membrane from a corner of the rack. Using paper towel, firmly grip the membrane and pull across the slab to remove. 2Use a fork to puncture the meat in between each bone on the rib. This helps tenderize the meat and also allows the smoke to further penetrate the ribs. 3With a kitchen brush apply a light coat of yellow mustard to both sides of the ribs. This will help the Rub Some Rib adhere to the ribs and will create a “bark” (or a nice crust) on the outside of the ribs. The acidity of the mustard also helps with tenderization. 4Reserve ¼ cup Rub Some Rib. Gently work the remaining rub into the ribs so the flavors can penetrate the flesh. Cover the ribs with aluminum foil and let stand 30 minutes. 1Remove the top grill grate from the charcoal grill and place coals on one side of the bottom rack. Spark the coals, however you prefer (chimney, fluid), and let the coals burn until they are covered with a thick layer of gray ash. 2Drain the wood chips and place about 3 cups on the hot coals. Cover the grill and open the vent, also known as the damper, on the lid. The damper helps to control the heat: opening the vent creates more heat, while a slightly opened or closed vent helps reduce or maintain the heat. 3Once the wood chips start smoking, remove the lid. Add about 1 cup wood chips over the hot coals. Place an aluminum foil loaf pan on the bottom rack opposite the hot coals. Add 4 cups of water to the pan, and whisk in the reserved ¼ cup Rub Some Rib. If the grill does not have a built-in thermometer, attach an oven thermometer to the top grill grate and replace the top grate into the grill. The grill should be at the ideal smoking temperature of 250°F. 1Once the temperature of the smoking chamber reaches 250°F, use tongs to shingle the ribs on the top grill grate over the pan of water. Cover the grill and smoke the ribs 5 to 6 hours, rotating the ribs every hour. To maintain the temperature of the grill at 250°F, carefully add additional coals periodically through the opening at one side of the top grill grate or in between rungs of the top grill grate. In the same fashion, periodically add wood chips onto the hot coals as smoking decreases. 2Once the ribs are tender, use a BBQ brush to brush them with half of the Three Little Pig's Competition BBQ Sauce. Cover the grill and cook for 25 minutes to glaze the ribs with a luster of sauce. 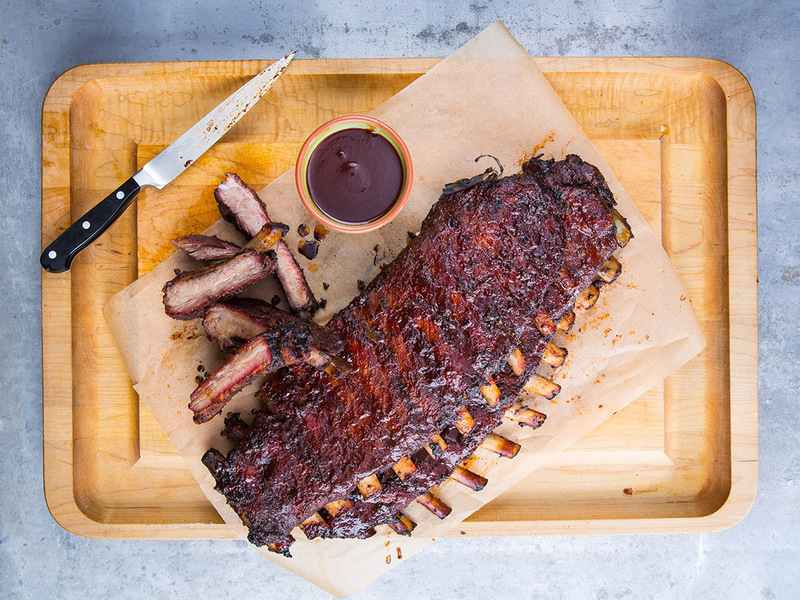 Let ribs rest for 5 minutes, eat, be happy; serve with remaining Three Little Pig's Competition BBQ Sauce for dipping.